It would seem that he attended Dragoncon in Atlanta, caught some kind of bug, and died in his sleep on September 8, after complaining of feeling unwell in his last blog post, on the 7th. 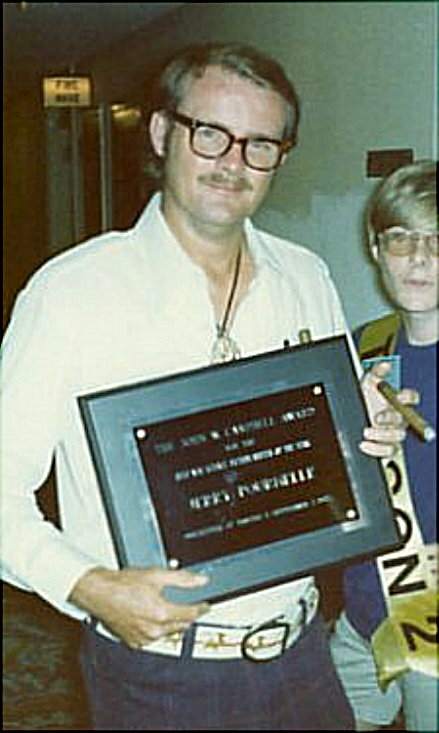 Pournelle has been a major figure in the field for as long as I have been a part of it. I first met him in 1973 at the worldcon in Toronto, where both of us were finalists for the John W. Campbell Award for best new writer (along with Lisa Tuttle, Ruth Berman, George Alec Effinger, and Robert Thurston). That was the very first year the award was given. To the surprise of no one, Pournelle won, though Geo. Alec Effinger finished so close behind the con gave him a special second place plaque, the only time THAT ever happened. (How close, you may ask? Ten votes, two votes, a single vote? No one knows. In those days, worldcons did not release vote totals). The Hugos were given at a banquet in those days. I could not afford a ticket, so I came in after the meal for the awards. It was rather an unusual ceremony. The Hugo rockets had not arrived, so the winners received only empty bases... except for Jerry, since the Campbell sponsors (Conde Nast, in those days) HAD managed to come up with a plaque. There's Jerry holding it, above. The other weirdness about that night was that toastmaster Lester del Rey, for reasons only known to himself, chose to present the awards backwards. In other words, he started with Best Novel (the 'Big One,' then as now), working his way though short fiction and to the fan awards, and ended with the brand-new never-given-before Campbell. Thing is, people started leaving after each award was given, and by the end, there was hardly anyone left in the hall except me, Jerry Pournelle and his party, and the other nominees and their friends (I think Lisa Tuttle and Ruth Berman were there, but Thurston and Effinger were not, someone else accepted the plaque for Piglet). I came out of the night all right. It was an honor, a huge honor, just to be nominated. And in the aftermath I came up with the idea of a Campbell Awards anthology. A couple editors told me it was an idea worth pursuing, but of course I needed to get all the nominees to sign on... and the key one was Jerry, the winner. So I bought him a drink and pitched him the notion, and he said yes (though, being the consummate pro, he made that contingent on me being able to pay competitive professional rates). Eventually that conversation led to my NEW VOICES anthology, and launched my career as an editor and anthologist... and I'm still going strong there, forty-four years later. The Hugo voters knew what they were doing when they gave Pournelle that first Campbell; he went on to have an amazing career, both on his own and in collaboration with other writers, particularly Larry Niven. With INFERNO, LUCIFER'S HAMMER, FOOTFALL, and (especially) MOTE IN GOD'S EYE, the two of them helped transform the field in the 70s. They were among the very first SF writers ever to hit the big bestseller lists, and among the first to get six-figure advances at the time when most writers were still getting four figure advances... something that Jerry was never shy about mentioning. Though he was nominated for a number of Hugo Awards in the years that followed, he never won one... but if that bothered him, he did not show it. "Money will get you through times of no Hugos better than Hugos will get you through times of no money," he said famously. Pournelle was fond of talking about all the help Robert A. Heinlein (whom he always called "Mr. Heinlein," at least in my hearing) gave him when he was starting out, and he was a passionate advocate of RAH's "pay it forward" philosophy, and did much to help the generations of writers who came after him. He served a term in the thankless job of SFWA President, and remained an active part of SFWA ever after, as part of the advisory board of Past Presidents and (even more crucially) on GriefCom, the Grievance Committee. Jerry could be loud and acrimonious, yes, and when you were on the opposite side of a fight from him that was not pleasant... ahh, but when you were on the SAME side, there was no one better to have in your foxhole. I had need of SFWA's Griefcom only once in my career, in the early 80s, and when we met at worldcon with the publisher I had Jerry with me representing Griefcom. He went through the publisher's people like a buzzsaw, and got me everything I wanted, resolving my grievance satisfactorily (and confidentially, so no, no more details). His politics were not my politics. He was a rock-ribbed conservative/ libertarian, and I'm your classic bleeding-heart liberal... but we were both fans, and professional writers, and ardent members of SFWA, and we loved SF and fantasy and fandom, and that was enough. You don't need to agree with someone on everything to be able to respect them. And while MOTE IN GOD'S EYE may not have won the Hugo in its year, it remains one of the great classics of space opera, destined to be read and re-read for as long as people read science fiction (it IS an honor just to be nominated). The last time I saw Jerry was at Keith Kato's chili party at MidAmericon II. He loved Keith's chili as much as I do, another point in his favor. R.I.P. Jerry. You were one ornery so-and-so, but you were our ornery so-and-so. Hoist a pint for me at that Secret Pro Party in the sky, and say hello to Mr. Heinlein.